Veris Accelabar installed on vaporized liquid natural gas line. 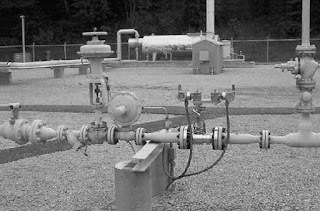 A liquid natural gas plant in the Midwest needed to measure gas flow to heaters that vaporize LNG to gaseous natural gas for use during peak periods in the winter season. The company stores LNG in two 12,000,000-gallon tanks and uses gas-fired heaters to vaporize it as required to meet customer demand. For most of the year demand is low (1,000 SCFH); however, during the coldest winter months gas consumption jumps to 60,000 standard cubic feet per hour (SCFH) in a 3” sch 40 line at 80 psig/70° F.
The plant must account for the gas usage over the entire range as it is part of the operating cost during LNG vaporization, as well as when it is used for plant heating. The customer could not find one meter to accommodate the entire range accurately. The plant had attempted to measure the flow rate with a Roots turbine meter sized for the maximum flow rate, but could not get accurate flow readings at the low end of the measurement range, making it impossible to determine actual usage during the off-peak periods. In addition to accuracy limitations, turbine meters have moving parts that wear and require expensive maintenance. The customer’s operating cost was estimated and charged against the bottom line. In addition, as you can see from the photo, there was no straight run available which hindered a conventional meter’s ability to perform accurately. A Model AF 3” 150-H-M Accelabar was installed immediately downstream of a pipe reduction, control valve and pressure regulator. The Accelabar had two Foxboro IDP50 high accuracy DP transmitters directly mounted to the top of the Accelabar sensor. Stacked outputs were required to accommodate the wide turndown in DP of 308.2” w.c. at max and 0.08” w.c. at min. The Accelabar performed as advertised with ±0.75% accuracy over the entire range of 1,000 to 60,000 SCFH—a flow turndown of 60:1. Because the Accelabar and transmitters have no moving parts to wear or seize, maintenance is minimal. 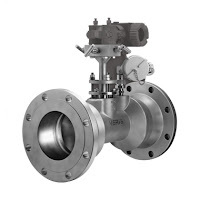 The LNG supplier has found that the flow metering system is user friendly and easy to operate, especially since DP flow measurement is one of the most easily understood of any flow measurement technology available. To the LNG provider, this translates into improved material accountability and lower operating costs to increase profitability. Reprinted with permission by Veris, a division of Armstrong International. 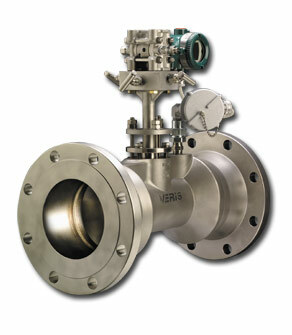 The VERIS Accelabar® is a unique flow meter that combines two differential pressure technologies to produce performance never before attainable in a single flow meter. The VERIS Accelabar® is capable of measuring gases, liquids, and steam at previously unattainable flow rate turndowns—with no straight run requirements. The VERIS Accelabar® can be used in extremely limited straight run piping configurations. All necessary straight run is integral to the meter. The stabilization and linearization of the velocity profile within the throat of the nozzle eliminates the need for any upstream or downstream pipe runs. Read the document below for more information or download the VERIS Accelabar® PDF from Mead O'Brien's website here. VERIS Accelabar Flow Meter from Mead O'Brien, Inc.
A large University was using magnetic flowmeters (Magmeters) to measure the flow of boiler feed water downstream of a condensate polisher. There were occasional system upsets that required the condensate polisher to be bypassed. When this happened, large amounts of debris would be released downstream and pass directly through the Magmeter, causing a build-up of foreign material on the internal sensing surfaces. A magnetic flowmeter uses an electric current applied to a coil which produces a magnetic field. When conductive liquid flows through the magnetic field, a small voltage, proportional to the liquid velocity, is induced. As long as the interior surfaces of the Magmeter are clean and unobstructed, the meter accurately measures flow. If they get dirty or coated, all bets are off. It was in the above mentioned upset situations where the University maintenance people were having problems. When upsets occurred, and the condensate polisher had to be by-passed, it meant the Magmeter would also have to be serviced because accuracy could no longer be guaranteed. Servicing the Magmeter was slow and costly. It meant shutting down the line, draining the pipe, removing the flowmeter, cleaning, and then putting it all back together. Armstrong International’s Veris Group was called in for a consult. 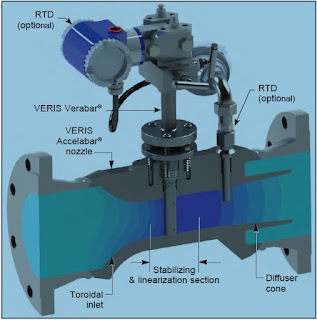 After review, the Veris Group recommended installing an Accelabar® flow meter to offer an alternative solution that could provide reliable flow measurement regardless of an upset condition like unpolished condensate. The Accelabar provided a flow range of 22.5:1 turndown in flow, in a limited straight run scenario. In the past, two transmitters were required to provide the best accuracy across the entire range of the Accelabar. Veris was able to use the Foxboro IDP 10S with its FoxCal™ technology in order to have a combined percent of rate accuracy solution. The new transmitter installation has 11 separate calibrations loaded into the device. As the differential pressure from the primary element is measured, the transmitter chooses the correct calibration curve. Veris’ solution delivered performance that was previously unattainable with a single differential pressure transmitter. The Accelabar and Foxboro combined to be best solution, and the Accelabar flow meter is now the University's standard for the boiler feed water measurements.